Lehman Catholic girls soccer loses 1-0 to Anna in matchup of state-ranked teams. Rob Kiser/Call Photo Lehman’s Catholic’s Lyndsey Jones brings the ball up the field Thursday against Anna. Rob Kiser/Call Photo Lehman Catholic’s Hope Anthony clears the ball from in front of the Lehman goal as goalie Hannah Giguere backs her up. Rob Kiser/Call Photo Lehman Catholic’s Grace Olding fights off an Anna defender as she moves the ball upfield Thursday night at Lehman. 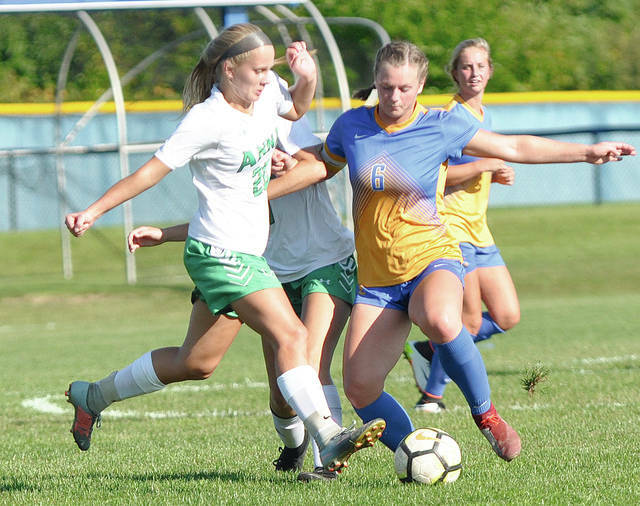 SIDNEY — It has become a battle of two Shelby County Schools that are arguably the top D-III girl soccer teams in the Dayton area. 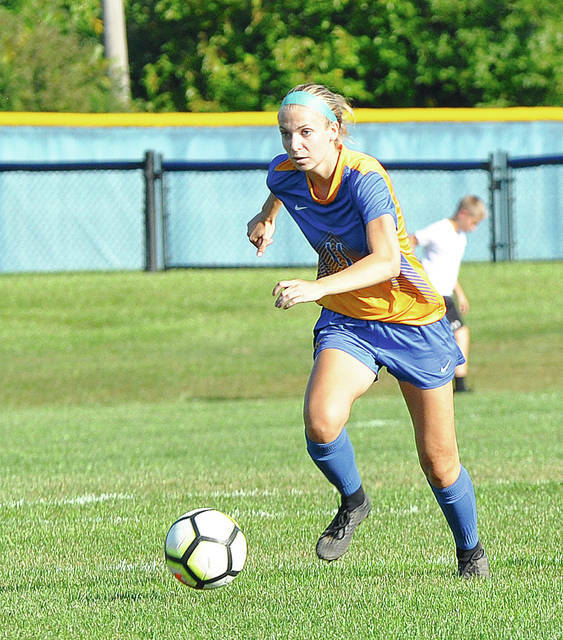 And Thursday’s matchup on the soccer pitch at Lehman Catholic High School involving the Lady Cavaliers and the Rockets from Anna did not disappoint. 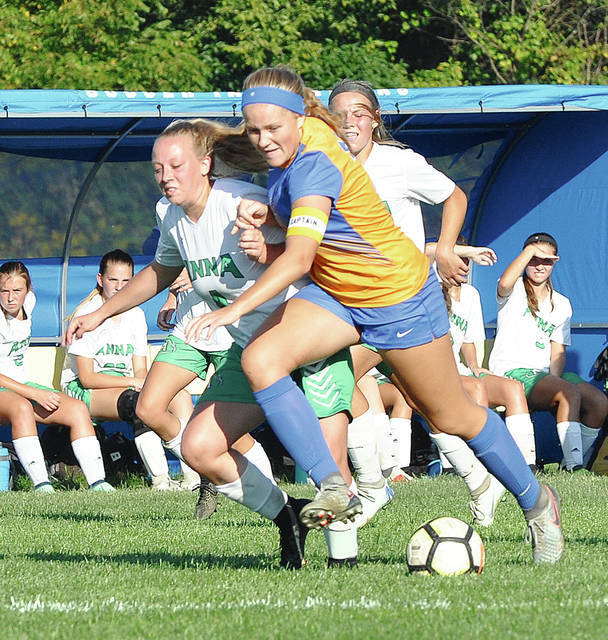 Lehman, the third-ranked D-III team in the state — and 12th ranked Anna went toe-to-toe for 80 minutes before the Rockets emerged with a 1-0 victory. 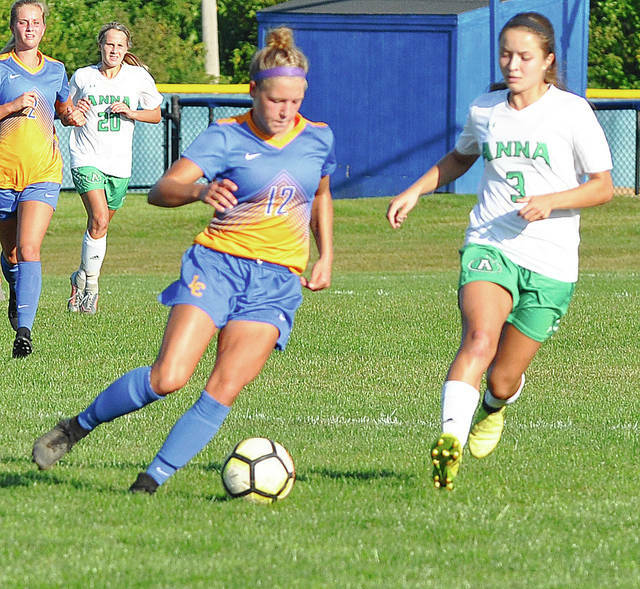 Anna improved to 6-0-1, while Lehman Catholic dropped to 4-1 — and it gave the Rockets the upperhand in a quest for a second straight Western Ohi0 Soccer League title. 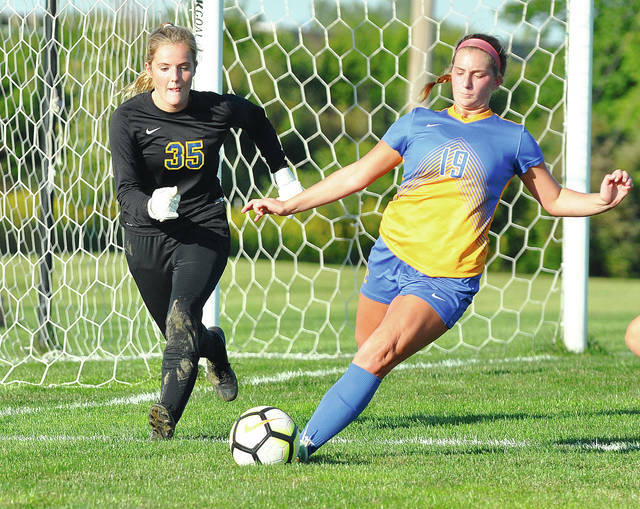 The result was the same a year ago — before the Lady Cavaliers won the district title after Anna goalie Savannah Hostetler was injured and could not play. The two teams battled for almost 70 minutes in the heat, before Taylor Knoll of Anna scored the game-winning goal. Anna had an earlier chance with 15:21 to go, when Giguere had to come out of the goal and the Rockets had an empty net. But, the shot hit off the crossbar and sailed over the net. But, with 11:32 remaining, Knoll took a deflection and found the net with shot that was deflected by Giguere. Lehman actually outshot Anna 11-6 in the game, but was never able to finish. And Lorenzo knows his team learned a lot from the matchup. And regardless of the outcome, it was a great night for Shelby County soccer. And as usual — the matchup lived up to the hype. https://www.dailycall.com/wp-content/uploads/sites/30/2018/09/web1_lyndseyjones.jpgRob Kiser/Call Photo Lehman’s Catholic’s Lyndsey Jones brings the ball up the field Thursday against Anna. https://www.dailycall.com/wp-content/uploads/sites/30/2018/09/web1_hopeanthony.jpgRob Kiser/Call Photo Lehman Catholic’s Hope Anthony clears the ball from in front of the Lehman goal as goalie Hannah Giguere backs her up. https://www.dailycall.com/wp-content/uploads/sites/30/2018/09/web1_graceolding.jpgRob Kiser/Call Photo Lehman Catholic’s Grace Olding fights off an Anna defender as she moves the ball upfield Thursday night at Lehman.